charcoal painting and glass painting, she spent considerable time on silk painting. She picked up Egg Art more than a seventeen years ago and improvised and experimented with the fusion of Indian and Islamic elements to this otherwise Western art. Farha’s repertoire of egg art include a wide selection of decorated Ostrich, Emu, Goose, Duck, Turkey, Guinea and Hen eggs. Each of Farha’s eggshells are intricately cut, carved and decorated by hand and ornamented using pearls, beads, crystals, brocade, velvet, satin, golden laces and rhinestone chains, making each piece a masterpiece and one of its kind. Farha employs various techniques for decorating egg shells like cutting, carving, decoupage, trolling, etching, engraving, dyeing and bead work. Farha creates each egg art piece with great precision and ingenuity, involving several man hours of intricate work. The resulting Objets d’Art are masterpieces which would lead the connoisseurs of art on a voyage into the realm of beauty and splendour. She uses a high speed tool for cutting to reduce torque and thus prevent shattering. Shells are treated then with liquid polymer to strengthen and preserve their natural beauty. The eggs are mounted on beautiful silver and golden stands. All eggs used for artistry belong to hatchery or farm grown birds only. No eggs are taken from the wild. 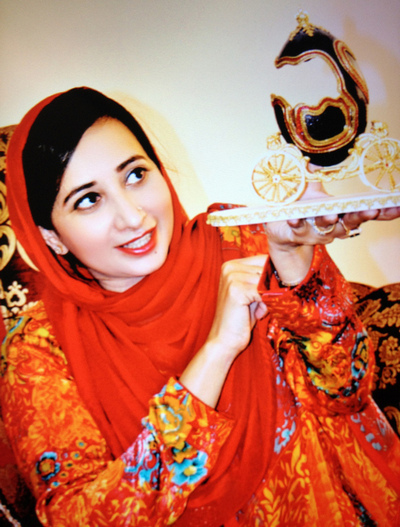 Farha has organised several shows and solo exhibitions of her Egg Sculptures including “EGGSPERIENCE” in Copenhagen, Denmark (April/May 2004); ‘EGGCELLENCE‘ in Jeddah, Saudi Arabia (June 2008); ‘EGGXOTICA’ in New Delhi in India (April 2010) and ‘EGGSPRESSIONS‘ in Sana’a, Yemen (June, 2012). Farha’s maiden solo exhibition in the United States, “Easter Eggs-travaganza” would be held in Chicago at the Chicago Symphony from March 20-21, 2016. Farha also participated in the 40th Annual Eggs-Ibit International (Dallas Egg Show) 2014 held at Dallas from June 6-8, 2014. Farha, a member of the International Egg Art Guild (IEAG), is a pioneer in promoting Egg Art in India. Several articles have been written on her art in prestigious newspapers and magazines of India and abroad. Farha has also been interviewed extensively on television and radio.